Our Price $64.95 Another currency? 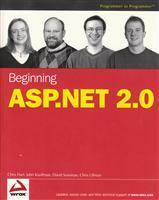 ASP.NET 2.0 is an amazing technology that allows you to develop web sites and applications with very little hassle, and its power and depth enable it to host even the most complex applications available. This invaluable beginners' guide shows you how to program web applications in ASP.NET 2.0 and see dynamic results with minimal effort. Using working examples and detailed explanations, this popular author team eases you into the world of ASP.NET development and gradually introduces you to all sorts of interesting ASP.NET tricks and tools. You'll quickly see how ASP.NET 2.0 is designed to ensure a significant reducation in the amount of code you have to write - and in turn, make your life easier.